Comparison of Insulin Pump Therapy with Multi-dose daily Insulin Injections in Indian Children with Type 1 Diabetes; 2016. Case report on Infantile Pseudohypoparathyroidism presenting as infantile obesity and calcinosis cutis. 2017. Dissertation on Utility of Invasive and Non-Invasive Diagnostic Tracheobronchial Techniques in the setting of Ventilator-Associated Pneumonia. 2000. Childhood and Adolescent Obesity. Delhi Pediatrics. Sep-Dec’2002. (Pg.9-13). Five case-reports of child abuse in a newsletter of the Child Abuse and Neglect Committee, India in the August 2005 issue. Jan’2017 : Consultant Pediatric Endocrinologist at Apollo Cradle, Nehru Enclave; Max Super-specialty Hospitals, Patparganj, Vaishali & Noida. 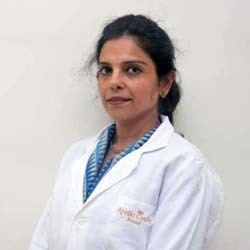 2008-2015: Consultant Pediatrician at Pushpanjali Crosslay Hospital, Vaishali.